You guys. Look. Look at that plate of deliciousness! Okay, let me take a step back. At the end of the week I’m headed to Tulum (which, in case you didn’t know, is a little beach town on the Caribbean coast of Mexico, about a 90 minute drive south of Cancun). I’ve never been to Tulum before, but I’ve heard it’s a wonderland of beautiful beaches & cenotes, Mayan ruins, bohemian vibes, and great food. And yes, when I’m back later this month, I’ll be sure to give you a full report, especially on the food aspect! While Tulum will be a new travel experience for me, I do know one thing I plan on eating a TON of while I’m there: pastor tacos. Thanks to my visit to San Miguel de Allende (a gorgeous town in central Mexico, south of Mexico City) last year, I now realize how wondrous true pastor really can be. Pastor is a big late-night draw in certain parts of Mexico, and it’s so much better than the late-night hot dogs we’re used to in the USA. And sure, I’ve had plenty of al pastor here in Texas, but it is NOT THE SAME as the succulent, spicy, rich meat you find in Mexico. The best pastor in San Miguel de Allende was at a little taco cart called Andy’s, which doesn’t open until after dark, so we’re talking late night treat only. And when I say taco cart, I mean taco cart. There’s a few little counter seats where you can get a glimpse of the action, but otherwise it’s standing room only. You walk up, order what kind of tacos you want and how many (trust me, never stop at just one) and then wait for your order to be ready and served up to you on a plastic plate covered in… more plastic. So let’s talk about the composition of these tacos. The pork revolves around on a giant upright spit (think similar to a traditional kebap or gyro). The pork is sliced directly off the spit, fried up on the flat-top with gooey white cheese, garnished with traditional toppings (onion, cilantro, spicy salsa). You can also get pineapple or no pineapple. Some people have an aversion to adding the fruit, but I love it. You can see it roasting there above the pastor itself. Just look at this glorious messiness… yes. These pastor tacos are traditionally served on small corn tortillas, but you can also get “gringo” style which is basically the same exact taco, just served on a big flour tortilla. You really can’t go wrong either way! If you’re ever in San Miguel de Allende, Andy’s is definitely the place to hit up… they don’t have a website that I can find, but if you ask a local, they should be able to help you out. And as far as the best pastor in Tulum… well, I’ll let you know sometime in March! Just a little snout sandwich at Tenderloin Grill in Kansas City, Missouri. It tastes like…um, like biting into an effing pig’s nose. With hot sauce. Foie Gras Coffee? Apparently, Yes. This photo might not look like much, but it’s one of the craziest things I’ve ever eaten (or drank, really). This was the second course at an ultra gorgeous, lavish Mexican wedding I attended last week. It’s a black bean cappuccino with foie gras. As in, it’s a coffee drink/soup blended with black beans, studded with chunks of seared foie and served with a crunchy meat and bread twist. It’s savory, velvety, and downright luxurious. I Googled around for any sort of recipe resembling what we enjoyed, but I couldn’t find anything very close. If you have anything, please feel free to enlighten us all in the comments. But let me just say this… If loving a damn foie gras cappuccino is wrong, I don’t want to be right. Fredericksburg is mostly known for its wine (yes, there is a Texas wine country) and I personally consider it “the Las Vegas of the Texas wine world” since you’re allowed to walk around with open containers in the streets/stores. I even got mardi gras beads from one of the tasting lounges, and since I have a real garbage party girl streak, I was super into it. The most surprising aspect of my carousal through Fredericksburg? Rustlin’ Rob’s, the wonderland of condiments and weird snacks, and unlimited free self-serve samples. Beneath its glowing red chili lights (seriously, so many novelty chili lights) Rustlin’ Rob’s has quite seriously EVERY kind of jam, jelly, jerky, spread, dip, salsa, and um, quail egg (?) a girl could ask for. The best/worst part? IT’S ALL AVAILABLE TO SAMPLE. ALL OF IT. Every single product has a self-serve sample next to it. Now, I know you’re wondering why I called this the “best/worst” thing when clearly it’s the best thing. But after eating literally 30+ samples of specialty jelly slathered over cream cheese and Wheat Thins, you’ll know when your train turns the corner straight into Worstville. Probably the most impressive section of RR’s is the hot sauce cave. I have never seen so much hot sauce in my damn life. For all of you who are forever chasing the dragon when it comes to the hottest hot sauce, Rustlin’ Robs is your heaven. It was the best of snacks, it was the worst of snacks. It was the heaven of snacks, it was the hell of snacks. Rustlin’ Rob’s contains multitudes. If you are ever in central Texas, I strongly urge you to stop by. And don’t eat lunch beforehand. Rise and shine, ESers! Feast your eyes on this: an insanely epic biscuits & gravy dish I discovered during Sunday brunch at Banger’s Sausage House & Beer Garden in Austin. The menu describes it as a “house-made biscuit, milk gravy & your choice of housemade bacon or housemade breakfast sausage” but let’s be real, that bacon is clearly just two huge slabs of pork belly. And just look at that river of gravy. These people are NOT messing around with their breakfasts and next time you’re hungover in Central Texas, you now know where to go. I recently spent a GLORIOUS long weekend in Sonoma County, California. What was I doing there? WINE TASTING, obviously! I guess some people go to Sonoma to ride bikes or shop or something, but for me it’s 100% wine, 100% of the time. One of the many highlights I enjoyed on this Sonoma wine weekend was an afternoon at Michel-Schlumberger winery, where we toured the grounds and cellars before settling into the best part of the winery: a five-course food and wine pairing in their beautiful back garden. Before each course, the chef came out and introduced his course, which wine was paired with it, and why. Educational and delicious! I loved every bite and sip. Let’s recap together! You just might find some inspiration for your upcoming summer cookout… there’s so much more to backyard BBQ boozin’ than just beer. Why a sparkling wine with this shrimp course? The crisp brightness of the brut pairs well with the delicate flavors found in both shrimp and Vietnamese seasonings. Sparkling whites can also stand up nicely to spicy food, and this shrimp definitely had a kick to it! So this might not look like much from the photo, but this bruschetta was phenomenal. Peaches and soft cheese are always a great combo, but the toasted pecans and the kiss of olive oil really added a roundness to the dish. This particular chardonnay boasts a smooth, full, creamy body that can stand up to the richness of the olive oil. The fruity notes of the chardonnay ties in with the light, sweet peaches as well. 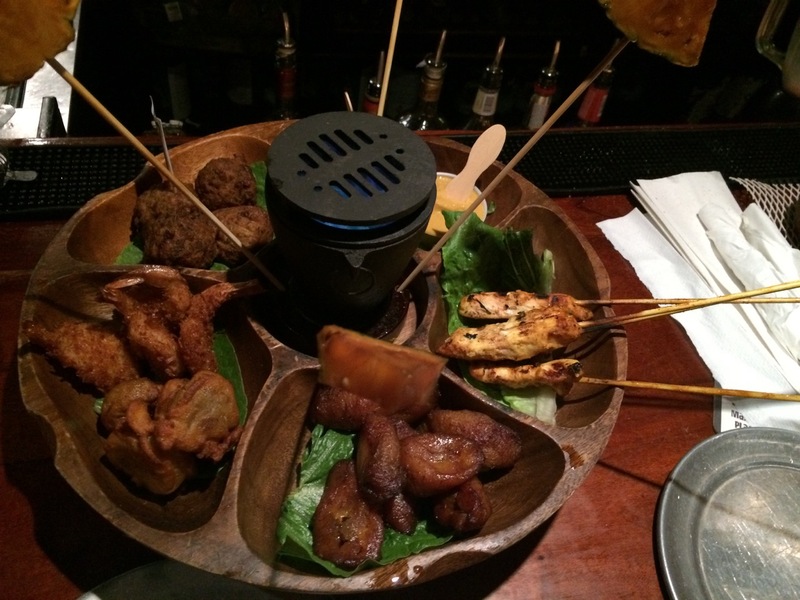 While you probably think of exotic tropical flavors when imagining Caribbean cuisine, Red Hook, St. Thomas’ East End hub, is no stranger to delicious bar food. From burgers to pizza to sandwiches to pupu platters, Red Hook really has anything you need for your drunk munchies and/or hungover desperation meals.